Our Note: Dogfighting and dog baiting is well known to those involved, but they make it VERY difficult for outsiders to find them. 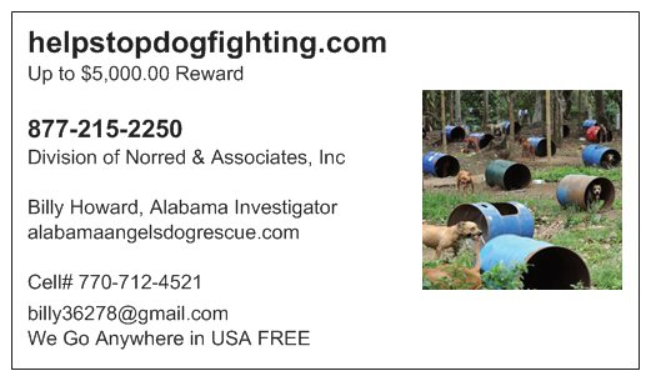 With the colder weather upon us, it might be even harder in some places to spot a dog fighting ring. This is because the dogs and events may be moved more routinely inside, and snow hides things even though leafless-trees makes it easier to look around. Dogfighting and dog baiting can be anywhere: from deep in a wooded area, to the basement of a condemned or boarded up house, to even someone’s fenced in backyard. If you THINK you see or hear something, or you KNOW about a person or animal involved in dogfighting and/or dog baiting, PLEASE report it. Many people don’t report it because some dogfighting and dog baiting rings are run by gangs. And ratting on a gang related event is cause for retaliation. But know that you can report dogfighting and dog baiting anonymously to your local 911. Yes, 911 will ask for your information, but legally they cannot and will not make your information known publicly. And if, you are still nervous about reporting dogfighting or dog baiting, reach out to us and WE will report it for you. Take a moment to google “Report Dog Fighting” for other references and information on how you can help, and report on this brutal and illegal practice.